The most wonderful time of the year includes festive sweaters and warm blankets to hide from the cold winter air. Not to mention family get-togethers with copious amounts of food and the desserts to boot. Ready or not, the holidays are upon us giving everyone numerous chances to indulge their sweet tooth. Here are just a few of our favorite cookies, pies, pastries and other desserts that are sure to be crowdpleasers at your holiday functions. Who said desserts couldn’t contain an abundance of fruits and still taste good? Sweetsboro’s Fresh Fruit Tart combines seasonal fruit held together by a light Bavarian cream on top of a soft dough crust. To add a little more sweetness, an apricot glaze is drizzled over the fruit. Breakfast is the most important meal of the day, but who says you can’t take it to the dinner table? These buns are bursting with cinnamon, wrapped in warm dough and covered in an addicting sticky glaze drizzled throughout and topped with your choice of raisins or walnut raisins. Count us in. Cannoli—the famous Italian pastries—are always a holiday must-have. Sweet cannoli filling is sandwiched between two fluffy ricotta cookies that are dusted with confectionary sugar and then rolled in semi-sweet chocolate chips. Just like that, we can never go back to regular cannoli ever again. 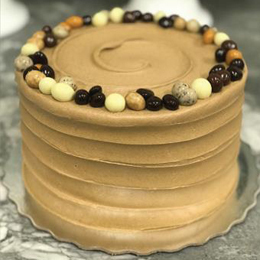 If you’ve only tried espresso in a drink, you’ve been missing out on this decadent dessert with creamy, espresso buttercream covering every inch and paired between two layers of moist chocolate cake. Your sweet tooth will rejoice with an added layer of chocolate ganache and a final touch of more espresso buttercream. It’s so good you won’t want to share with anyone at your table. Candy lovers will appreciate this melt-in-yourmouth treat. Sweet T’s Bakeshop upgrades your average Twix bar to their rendition of the Salted Caramel Bar with a gooey concoction of a thick, salted caramel laying over a crisp shortbread crust creating a perfect combination of sweet and saltiness in every bite. There’s nothing quite like the crowd-pleaser that is a traditional cheesecake. The creamy layer of cheese mix is sweetened to perfection and smooth to taste. A little bit of crunch can be found in the crushed cookie bottom layer of crust. With just enough sweetness to excite our taste buds, our daring friends might want to try this in red velvet or salted caramel varieties. These aren’t your average doughnuts. Baked fresh throughout the day, this fall favorite is warm, fluffy and melts in your mouth. Pair it with their famous apple cider and you’ve got yourself the perfect winter treat. Grab a dozen and spread the holiday cheer. Maria’s Mom’s Italian Cookie Cupboard, Marlton As the weather grows colder, this bakery will warm you up with a special treat that pairs well with your coffee. Their Apricot Filled Biscotti Loaf takes a new twist on traditional biscotti by giving it a sweetened flavor throughout the cookie texture. Start dunking before they are all gone. This bakery has all the sweets with none of the animal products. These gluten-free, vegan Ginger Snaps give everyone the opportunity to enjoy the combined ginger and cinnamon flavors of these holiday-themed cookies. Don’t be fooled, they are delicious. There’s nothing quite like pie during the holidays, and Pie Lady Café fulfills all of our cravings. Their Apple Crisp pie has exactly the right balance of fresh apples, spices and gooey sauce beneath a crumbled crust for just enough crunch. What’s an added bonus? A dollop of their fresh whipped cream.